The following table contains both the Latin prayer and an English translation. Magnificat anima mea Dominum; My soul doth magnify ["declare the greatness of"] the Lord. Et exsultavit spiritus meus in Deo, Salutari meo. And my spirit rejoiceth; in God my Saviour. Quia respexit humilitatem ancillae suae ecce enim ex hoc beatam me dicent omnes generatones. Because He hath looked down on the lowliness of His handmaid: for behold henceforth all generations will call me blessed. Quia fecit mihi magna qui potens est: et sanctum nomen ejus. Because the Mighty One hath done great things for me: and holy is His name. Et misericordia ejus a progenie in progenies timentibus eum. And His mercy is generation to generation: on those who fear Him. Fecit potentiam in brachio suo: dispersit superbos mente cordis sui. He showeth might in His arm: Hi scattereth the proud in the conceit of their heart. Deposuit potentes de sede, et exaltavit humiles. He casteth down the mighty from their throne: and exalteth the lowly. Esurientes implevit bonis: et divites dimisit inanes. He filleth the hungry with good things: and the rich He sendeth away empty. Suscepit Israel, puerum suum, recordatus misericordiae suae. He hath received His servant Israel: being mindful of His mercy. Sicut locutes est ad patres nostros, Abraham, et semini ejus in saecula. And He spake to our fathers: to Abraham and his seed forever. 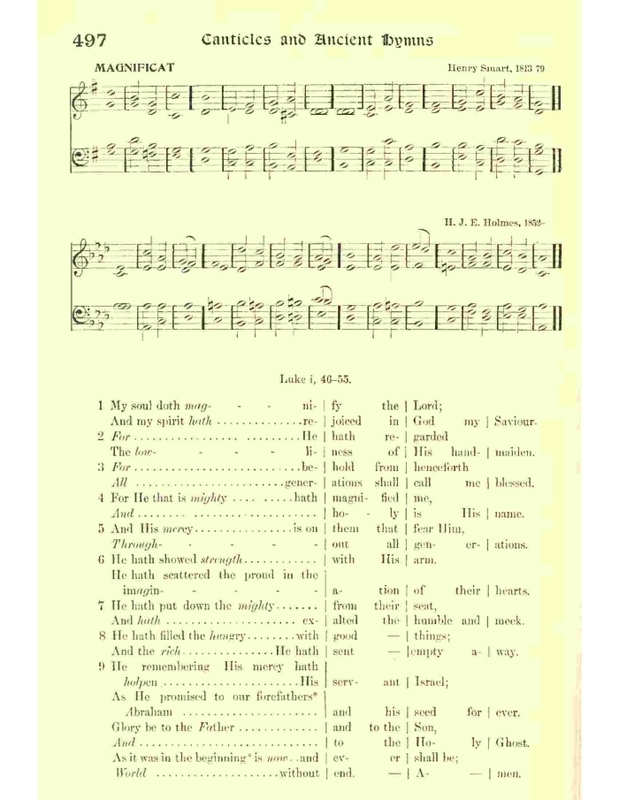 Sheet Music "Magnificat" by Henry Smart from Henry Sloane Coffin and Ambrose White Vernon, eds., Hymns of the Kingdom of God. New York: The A. S. Barnes Company, 1910, #497. 1:28 And the angel came in unto her, and said, Hail, thou that art highly favored, the Lord is with thee: blessed art thou among women. 1:30 And the angel said unto her, Fear not, Mary: for thou hast found favor with God. 1:51 He hath showed strength with his arm; he hath scattered the proud in the imagination of their hearts. 1:55 As he spoke to our fathers, to Abraham, and to his seed for ever. The Prayer of Hannah, 1 Samuel 2:1-10. 2:1 And Hannah prayed, and said, My heart rejoiceth in the LORD, mine horn is exalted in the LORD: my mouth is enlarged over mine enemies; because I rejoice in thy salvation. 2:2 There is none holy as the LORD: for there is none beside thee: neither is there any rock like our God. 2:3 Talk no more so exceeding proudly; let not arrogancy come out of your mouth: for the LORD is a God of knowledge, and by him actions are weighed. 2:4 The bows of the mighty men are broken, and they that stumbled are girded with strength. 2:5 They that were full have hired out themselves for bread; and they that were hungry ceased: so that the barren hath born seven; and she that hath many children is waxed feeble. 2:6 The LORD killeth, and maketh alive: he bringeth down to the grave, and bringeth up. 2:7 The LORD maketh poor, and maketh rich: he bringeth low, and lifteth up. 2:8 He raiseth up the poor out of the dust, and lifteth up the beggar from the dunghill, to set them among princes, and to make them inherit the throne of glory: for the pillars of the earth are the LORD's, and he hath set the world upon them. 2:9 He will keep the feet of his saints, and the wicked shall be silent in darkness; for by strength shall no man prevail. 2:10 The adversaries of the LORD shall be broken to pieces; out of heaven shall he thunder upon them: the LORD shall judge the ends of the earth; and he shall give strength unto his king, and exalt the horn of his anointed. Both citations are from the King James Version. Picture left: "The Angel Brings The Vision To Mary" by Gustave Doré. One hymn, of many, based on The Magnificat is The Song of Mary. And see the version by George Wither, That Magnify'd The Lord May Be. Another hymn is Thus Said Mary of Great Honor (Also known by the first line of the burden, Unto Marie he that love hath), by James Ryman. Index no. 3725. MS: Cambridge University Ee.1.12, fols. 26a-27b (1492). Editions: Zupitza, Archiv 89, 189-90 ; EEC, no. 257. 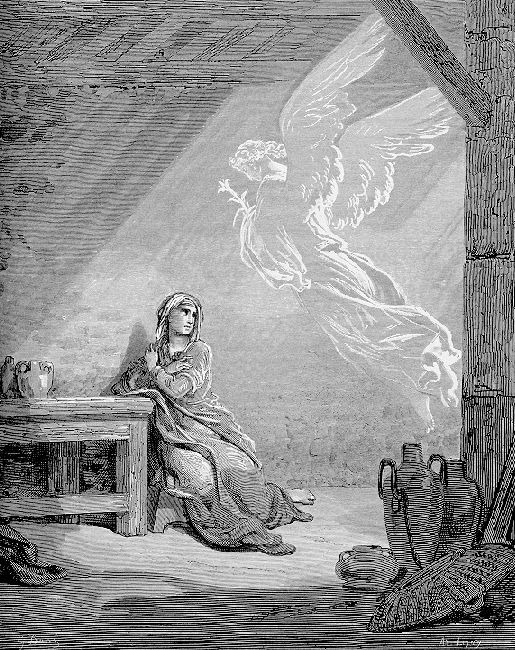 The visit from the angel Gabriel, known as "The Annunciation," is celebrated in a number of carols, one of the oldest being Angelus Ad Virginem; there are numerous translations based on this Latin carol. Likewise there are numerous carols that celebrate Mary's response, including: Magnify the Lord To-day. See also, from the modern Liturgia Horarum, Magníficat.